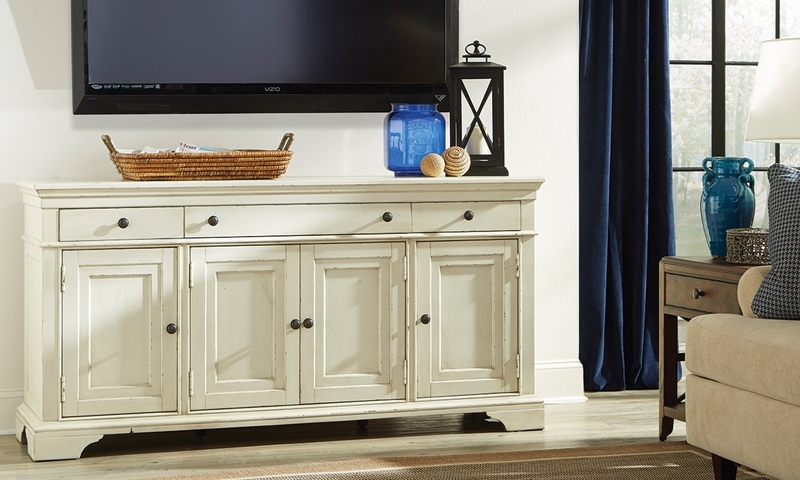 With its gently weathered whipped cream finish and burnished pewter hardware, this 68-inch media console from the Trisha Yearwood Collection will make the perfect addition to your living room or den. Great for larger television sets, this console is a crowd-pleaser equipped for storage with three dovetailed drawers on ball bearing slides and three cabinets beneath. Each cabinet features an adjustable shelf inside, as well as a rear cable management point. The largest center cabinet even features a built-in AC power strip to connect satellite boxes, game consoles and more.